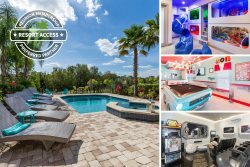 Located just 6 miles from Disney World, this stylish 6-bedroom, 5-bathroom home has enough space to sleep up to 12 guests. This villa features great decor and great furnishings. Fully equipped kitchen with state of the art appliances. Private screened pool and a great patio area with covered lanai with dining table and chairs to enjoy poolside meals. Perfect acommodation with comfortable rooms for the whole family including themed bedrooms for the kids and game room.